Did you know that spring is actually the best time of year to purchase a new A/C unit? This is because spring is considered the “off season” for the HVAC industry—the weather tends to be milder and thus demand for heating and cooling equipment and service is naturally lower. But if you wait until summer, when the temperatures begin to skyrocket, manufacturers and distributors know they can command full price for HVAC equipment, and contractors are busy repairing and installing air conditioning equipment—often on an emergency basis. 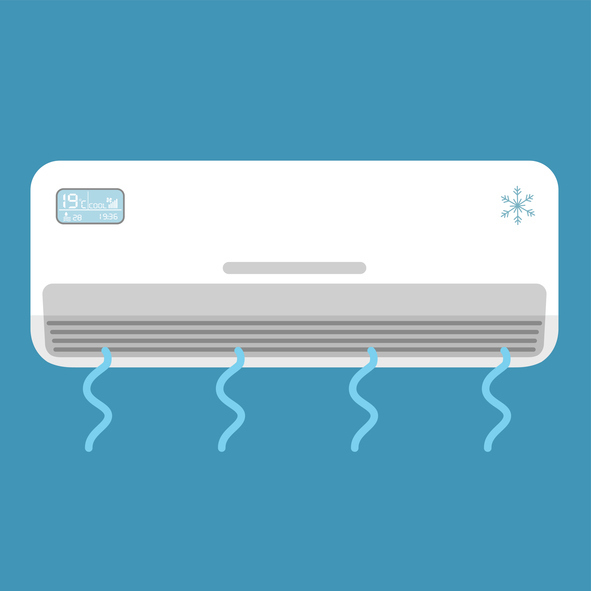 So if you like to take your time choosing a new major appliance, and you like to get the best possible deal on new equipment, now is the right time to start taking steps toward purchasing a new air conditioner! P.S. Read all the way to the end of this article to learn how you can save up to $1,000 on a new air conditioning unit! Perhaps the most important part of selecting a new air conditioner is matching the size of the A/C unit to the size of the space it needs to cool. There are two important measurements to know when sizing a new air conditioning unit for your space. As you will see, these measurement units are basically interchangeable. In the HVAC world, a “ton” is not a measurement of weight, but a measurement of cooling ability. Oddly enough, this measurement arose at a time when the predominant way of cooling a space was to blow a fan across a block of ice! The measurement stuck, which means that today, a “one-ton” air conditioner has the cooling capacity of a one-ton block of ice. Another way of measuring a new air conditioner’s cooling ability is in BTUs. BTU stands for British Thermal Units. A BTU is the amount of energy it takes to drop the temperature of one pound of water by one degree. This means a one-ton A/C unit is equivalent to 12,000 BTUs (12,000 pounds of water) of cooling ability, a two-ton A/C unit is equivalent to 24,000 BTUs of cooling ability, and so forth. Within reason (see next section here), the higher the BTU rating, the more quickly the air conditioner can cool down your space. Once you understand the basic terminology the HVAC industry uses to describe cooling ability, it becomes easier to choose an A/C unit that is appropriately sized for your space. But this isn’t quite so easy as it sounds! Room sizing must also factor in amount of direct sunlight, ventilation, ceiling height, room location, room use (kitchen, laundry room, etc. ), amount of insulation and outdoor climate. For this reason, it is always wise to consult a trusted HVAC contractor to match the A/C unit to your space. In past decades, there was also a tendency to assume that a larger air conditioner was always better, no matter what the space size might be. We now know that installing a too-large air conditioner is no better than installing a too-small air conditioner, and both will cost you more than you need to be paying for energy each month. This holds true whether you are installing a simple window unit, a zoned ductless A/C system or a central air conditioner. What you want is a unit with sufficient power to efficiently cool your space, neither too little nor too much. Calculate the square footage of the room. Match the square footage to the appropriate tonnage/BTUs. Adjust based on additional variables. More than two regular room occupants: add 600 BTUs per every additional occupant. Kitchen space: add 4,000 BTUs. More direct sunlight: add 10 percent capacity (in BTUs). More deep shade: subtract 10 percent capacity (in BTUs). As well, if your room shape is non-standard (i.e., not a basic square or a rectangle), you may need to add or subtract additional capacity accordingly. There are several types of air conditioners: central ducted systems, zoned ductless systems, window units and freestanding portable units. Heat pumps are also a type of cooling/heating system that serve a similar purpose. The type of air conditioning system you choose can impact what your system looks like and how many components you install. For example, if you opt for window units or freestanding portable units, you may need one for each room in your space. With a central air conditioning system or a heat pump ducted system, you will typically need only one component connected to a network of ducts and air registers. With a zoned ductless system, you may need several inside units (one per room) connected to a central zone management system. A knowledgeable HVAC contractor can help you plan the installation of your new air conditioning unit to ensure you have the right-size components for each room in your home or office. Right now and through June 30, 2018, play our Scratch & Win Golden Savings contest and win up to $1,000 off a new air conditioner, A/C and furnace combo, or heating boiler. Just fill out this simple online form to play! Now, with summer right around the corner, is the perfect time to schedule your air conditioning preventative maintenance inspection and service call. Is this the year you will upgrade your air conditioner and/or heating system? Give us a call at 905-549-4616 or contact us online for help choosing the right size and capacity of unit for your home or workplace!